The Finnish striker has completed a move to the Copenhagen side. 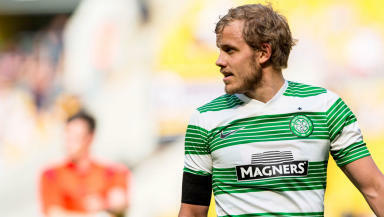 Teemu Pukki has made a surprise move to the Danish Superliga, signing for Brondby from Celtic on loan. The forward is the second player to move from Celtic Park to Brondby on transfer deadline day, following young striker Holmbert Fridjonsson who earlier signed for the club. Pukki had joined Celtic from Schalke 04 in a deadline day deal in September 2013 and was handed a four-year deal. The Finland international scored on his Celtic debut against Hearts and added a second goal a week later against St Johnstone but he failed to find the net regularly scoring just seven times over the course of the season. Used only occasionally by former boss Neil Lennon, Pukki initially looked to have been given a new lease of life by new Celtic boss Ronny Deila. He was introduced from the bench in Deila’s first competitive match, against KR Reykjavic and started the return leg of the Champions League qualifier, scoring twice. He failed to make an impact in the matches against Legia Warsaw and was substituted at half-time in the league defeat to Inverness Caledonian Thistle. Pukki will wear the number nine shirt for Brondby.